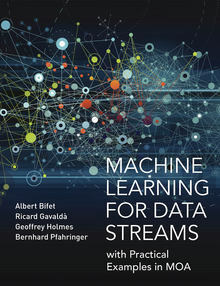 The new book “Machine Learning for Data Streams with Practical Examples in MOA” published by MIT Press presents algorithms and techniques used in data stream mining and real-time analytics. Taking a hands-on approach, the book demonstrates the techniques using MOA (Massive Online Analysis), allowing readers to try out the techniques after reading the explanations. The book first offers a brief introduction to the topic, covering big data mining, basic methodologies for mining data streams, and a simple example of MOA. More detailed discussions follow, with chapters on sketching techniques, change, classification, ensemble methods, regression, clustering, and frequent pattern mining. Most of these chapters include exercises, an MOA-based lab session, or both. Finally, the book discusses the MOA software, covering the MOA graphical user interface, the command line, use of its API, and the development of new methods within MOA. The book will be an essential reference for readers who want to use data stream mining as a tool, researchers in innovation or data stream mining, and programmers who want to create new algorithms for MOA.